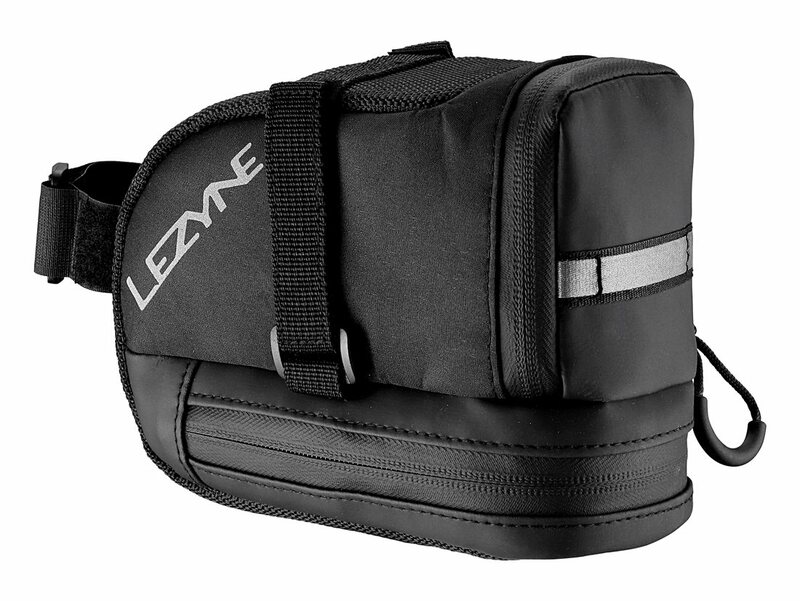 Perfect for long rides or races, the Lezyne L caddy has plenty of storage space, and compartments keep you organized. The large main compartment features neoprene pockets for organizing your flat repair tools, along with money, and an ID. Smaller sub- compartments offer enough storage space for your cell phone, multi-tool, and nutritionals. I loved this seat bag for the first six months or so. The slim design maximizes volume without being in the way. The dual compartments and internal pockets are great for organizing tools and small parts. the zipper on the first bag broke during the first week...called jenson and they sent me a new bag and that zipper lasted till today 10 months later. jenson customer service is excellent and they are sending me a new Topeak bag. Jenson is my "Go To" online bike shop! Great prices, great service! Thanks for being there! This seat bag holds everything you should need. It has two separate zipper compartments, reflective tape and is easy to attach. I have the large size. Unfortunately, it's still a bit snug for my. My road bike has 35mm tires and the tube is a tight fit underneath. I really like the design idea, with separate pockets for different functions. However, the pockets aren't quite large enough for the tire tools, nor is the money pocket easy to get into, and it's just too small for a credit card. Maybe if that pocket were on the flap . . . The bag seems to be put together well, so I don't expect to have it rip apart. I like the zipper pulls, easy to grab. I wanted bag to relieve the need for backpack. I have a full suspension mtb. Immediately on downhill, noticed a rubbing sound. Then as soon as hit small jump, rear tire grabbed bag and opened it up all over. It is perfect to fit everything you need in it. Tube,wrenches,etc. The quality of the zipper was a concern from the get go as the fold over seem liner seemed to always get in the zipper. This would be for road bike or hardtail if you do not drop your seat. I had the bag for a year and never opened it. I opened it to get the multi-tool and the zipper broke when trying to close it back up. I bought two of these bags; the zipper failed on both. Will an iPhone 8 fit in this bag?